Mozilla plans to improve the built-in screenshot tool of the Firefox web browser in Firefox 59 Stable by adding image editing functionality to the server uploaded images are hosted on. Update: The feature is available for all versions of Firefox as it was enabled server-side. Screenshot functionality is not entirely new. Mozilla added screen capturing options to Firefox back in 2012 when it added the functionality to the browser's Developer Toolbar. The Screenshot tool, however, improved the visibility of the functionality. First launched as the Test Pilot experiment Page Shot and integrated natively in Firefox Nightly in mid 2017, Screenshots was launched officially in Firefox 56 Stable. Firefox users may use Screenshots to capture the entire visible area of a web page or a rectangle area of it. Users can save captured screenshots to the local system directly, copy screenshots to the Clipboard of the operating system, or use the integrated upload functionality to store them temporarily on Mozilla servers. The new screenshot editing functionality is available already. Firefox users who upload screenshots to Mozilla's server may notice that Mozilla added image editing functionality to the online part of Screenshots. Pen to draw on the screenshot. Highlighter to highlight specific areas of the screenshot. Color Picker to select one of nine different colors. The functionality is useful to make quick edits but it misses important editing options such as blur, select, or changing the pen's size. You may zoom in and out using Ctrl-mousewheel. A click on the save icon saves the edited image, a click on cancel ignores all changes that you made using the image editing tools. Firefox's Screenshot tool is not a unique feature. Opera Software integrated screenshot editing in Opera 49 Stable released in November 2017, and Vivaldi Technologies screenshot functionality in Vivaldi 1.7 released in later 2016. Firefox users had access to extensions like NativeShot to integrate screen capture functionality in the browser. NativeShot is not compatible with Firefox 57 Quantum. Firefox's Screenshot tool is popular according to Mozilla. 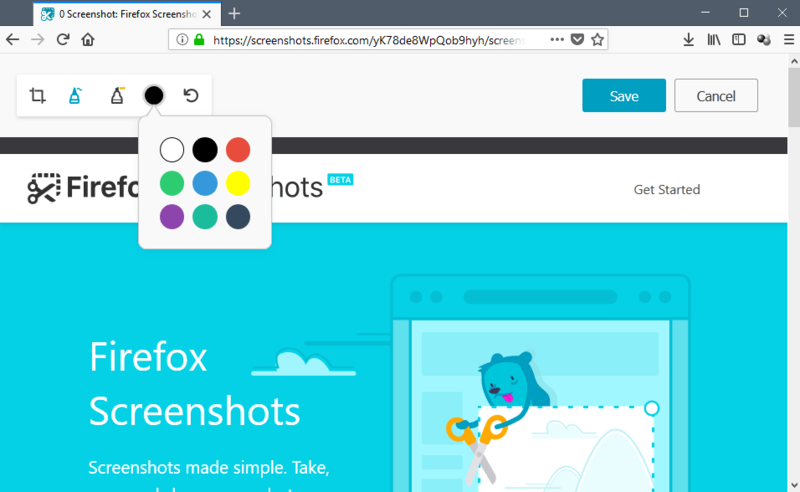 John Gruen, Product Manager of Firefox Test Pilot, revealed that Firefox users took more than 64 million screenshots since the integration in Firefox 56. Mozilla plans to improve the built-in screenshot tool of the Firefox web browser in Firefox 59 Stable by adding image editing functionality to it. Is there a addon to configure Firefox bloatware or even remove it? Hi, someone said, return to FF52 ESR Version, did it, fixed all the issues i had with FF57+. I’m personally not aware of any addons that will disable or remove FF system addons but there are options. You can run a local script to delete the contents from “C:\Program Files\Mozilla Firefox\browser\features” but you’ll have to remember to do it again after the browser is updated because the addons will be restored. Add this line: (del /Q “C:\Program Files\Mozilla Firefox\browser\features\*”) to a text file, without the brackets, and save it as “Delete Firefox browser features.bat” without the quotes. You can instead disable all of the system addons in about:config except for ‘Follow On Search’ which can not be disabled within about:config. You can use the ghacks-user.js as a resource for the entries, Line#326 section 0500. Paste all this in a .bat file and run it as admin. (Replace “Program Files” with “Program Files (x86)” if you use x86 FireFox on x64 Windows). Also remember to do a custom install and opt out of the”Maintanance Service” and disable auto updates, you can let it notify you when updates are available (it’s the middle option). You need to remember to run that .bat file after every update, before you run FireFox. I hope in the future Mozilla add the text feature and then is perfect. Callouts, and shapes would be good too. Also integrate it in the add-on directly rather than server side, if that’s not too heavy. Feature creep is a thing. Possibly they are testing popularity on the server and if it is used often enough, it will be pushed into the add-on ? I doubt it — why go to the effort of setting up a server if your plan is to reimplement as an add-on later? But, if that is their plan, I hope they take into account that there are lots of people who won’t use it simply because it is a server-based thing, not because the functionality isn’t desirable. Also, I’m very glad this isn’t built into the core of Firefox. It should be an add-on. Note that this is not a planned improvement for Firefox 59 – it’s an update to the screenshots.firefox.com server that is already live and works with Firefox 58. Works on Firefox 60 as well. Based on the title I was expecting it to only work on v59, which I thought was rather surprising, seeing as Nightly should get everything before anything else. Makes sense now that I know it’s an update to the server! why not add a video capture option so we can all be covertly filmed? when will this stop, at the kitchen sink? =-== This post brought to you by my pet scorpion fuckface. No, it’s you who should rip the PrtSc key off your keyboard. How about doing something that really needs to be done, like fixing the printing problem that Firefox has had since almost forever? No wonder the Firefox download size is getting more and more bloated, ie 100+MB. Don’t we already have programs for capturing and editing a screenshot, eg the Prtsc key and M$ Paint.? Will Mozilla next include capturing and editing a video into FF.? Printscreen cannot capture scrolling pages. Capturing pages feature is good idea, you should submit that suggestion to Mozilla. Also using Print Screen key, starting up Paint, pasting the screenshot, cropping it, saving it, finding an uploading website, uploading it and finally grabbing the link, it’s pointlessly not straightforward and inaccessible to a normal user. There’s a clear improvement here. The point is that not every computer user use this feature. Why integrate it into the browser.? Let those who want to use this feature install it separately, eg as an extension or addon or a 3rd-party program. This is why the Win 10 ISO or upgrade file is a huge 4GB download which has to be downloaded by users every 6 months. ……. For FF, it’s every 2 to 3 months for the ever-increasing 100+MB download. Maybe M$ should also integrate Office 365 and Adobe Photoshop into Win 10.??? You’re assuming a use case that certainly isn’t universal (I’m guessing it’s not even the most common). When I take screen shots, I’m almost never doing so to upload to a site somewhere. I’m usually doing so to attach it to a private email. So, on Windows, my procedure is: hit printscreen, paste it in Paint, save the file, email it. On Linux (kde), it’s even easier: hit print screen, email it. 38Mb. Screenshots is but a tiny fraction of that.